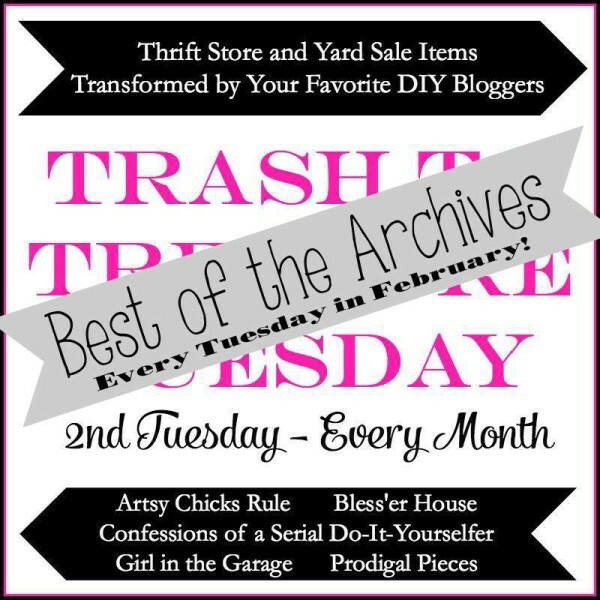 My “Trash to Treasure” friends and I decided to bring you a “Best of the Archives” for the month of February. So, instead of sharing a new trash to treasure next Tuesday, we are going to bring you 4 every Tuesday this month. They will be “new” (or new to you) treasures that we are pulling deep from the dusty ole archives. 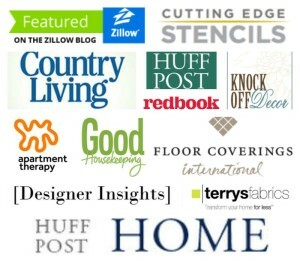 We hope you will enjoy seeing some of these projects you may have never seen before! One of my very favorite (to this very day!) 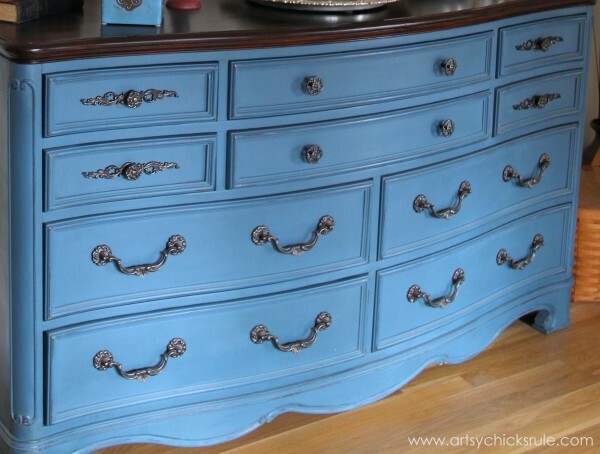 projects (and one of my very first on the blog here) is my AUBUSSON BLUE DRESSER. 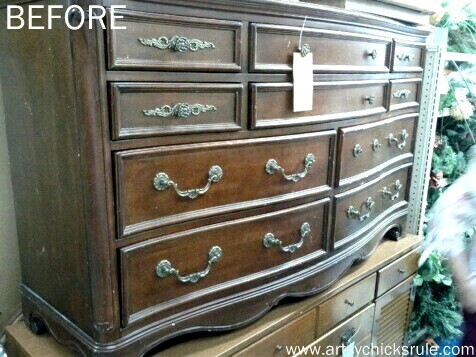 It was definitely in need when I found it at the thrift store….for $35! What a bargain….except it was missing a handle as you can see below. 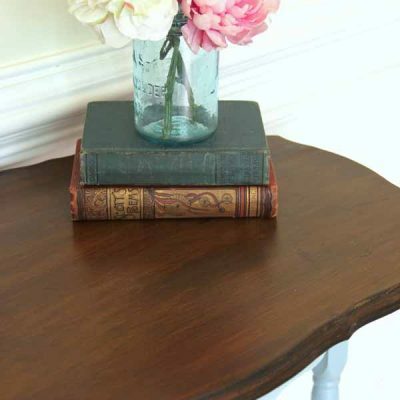 I wanted to keep the top natural in a nice deep, rich shade like walnut and paint the rest. I also knew exactly where I was going to put it. It actually still sits in the same spot almost 4 years later! 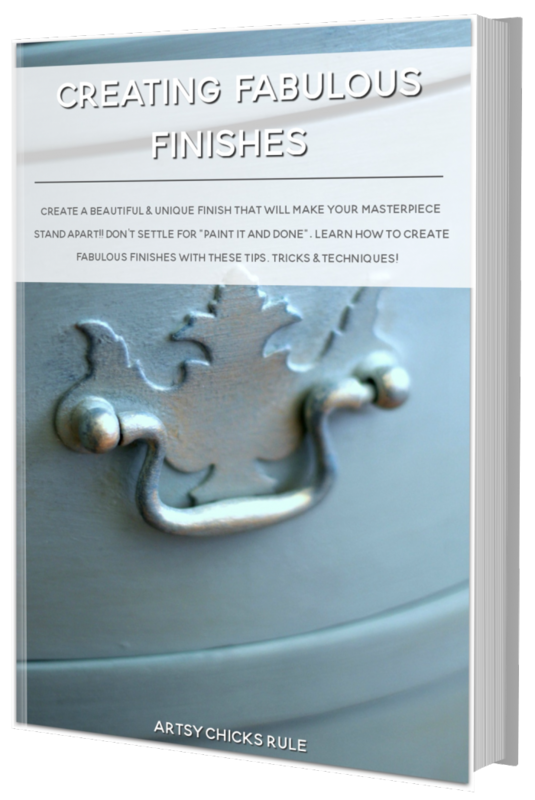 As far as that missing handle dilemma, you can read how I actually made a handle to match >>> here. 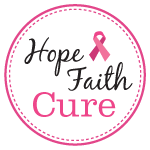 I’m including a few affiliate links below for your convenience. See my full disclosure here. 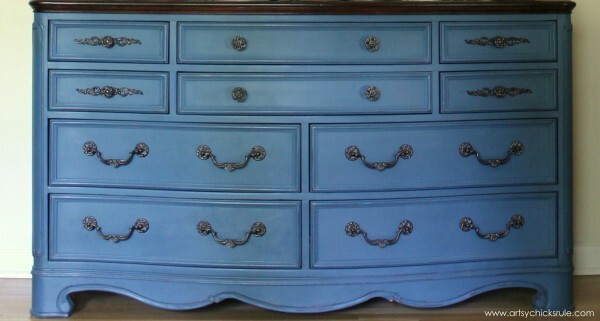 I used Chalk Paint® by Annie Sloan in the color “Aubusson Blue”. 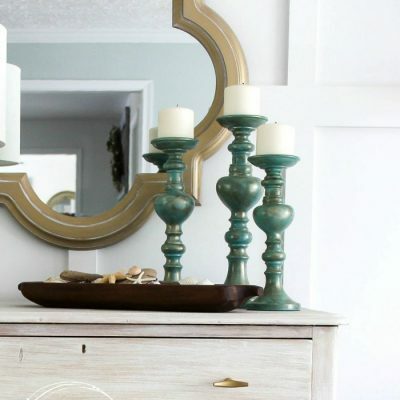 I LOVE (love, love, love) this color. 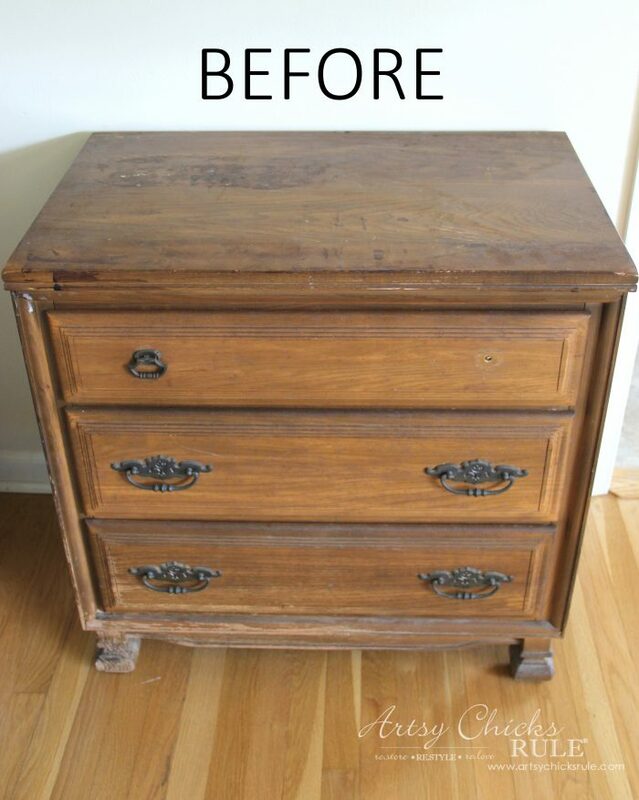 I very lightly distressed this one by sanding the edges before I waxed. 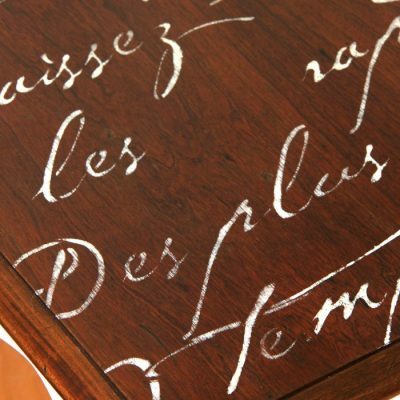 I applied the was to the entire piece (except the top) and hand buffed to create that gorgeous sheen. For the top, I used Citristrip (my favorite!) 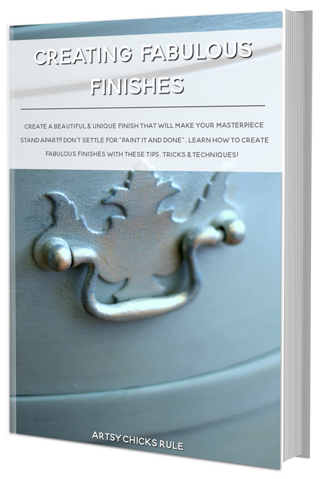 to remove most of the finish. 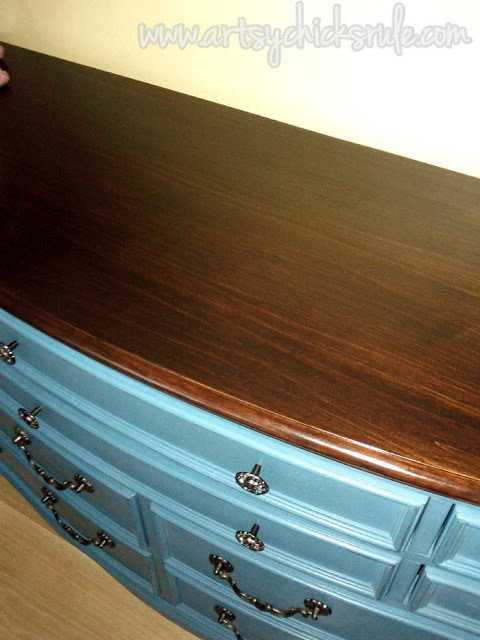 Then I sanded it completely down to the wood and applied a dark walnut stain. For the handles, I gave them a quick spray with Oil Rubbed Bronze Spray paint and a touch of gold paint to highlight. 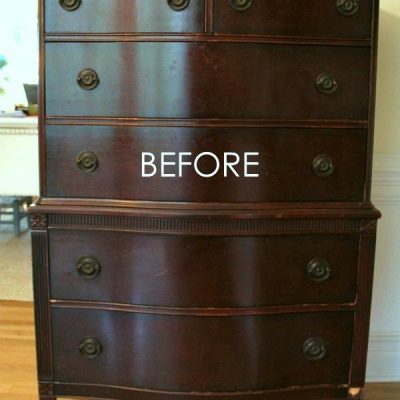 I sure wish I had taken photos of the process but I was mostly sharing “before/after” shots at that time. Look at that gorgeous wood top. That stain is just beautiful! 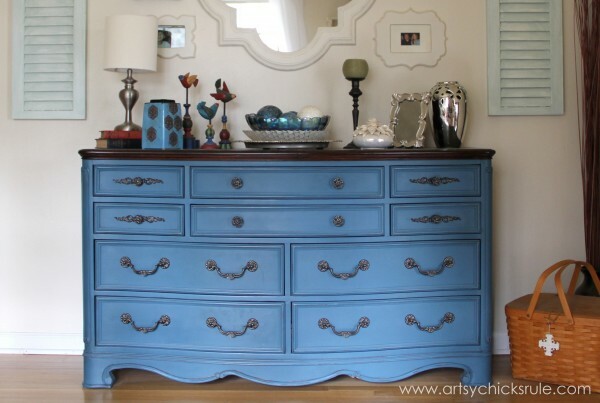 I love color…and I LOVE paint but I do love wood peaking through here and there. And the final “before/after” shot. 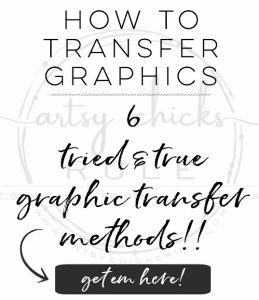 Be sure to see what my friends are sharing this week below! Last year was brutal so I’m happy it’s been mild!!! This is still one of my favorites too!! Just gorgeous!! 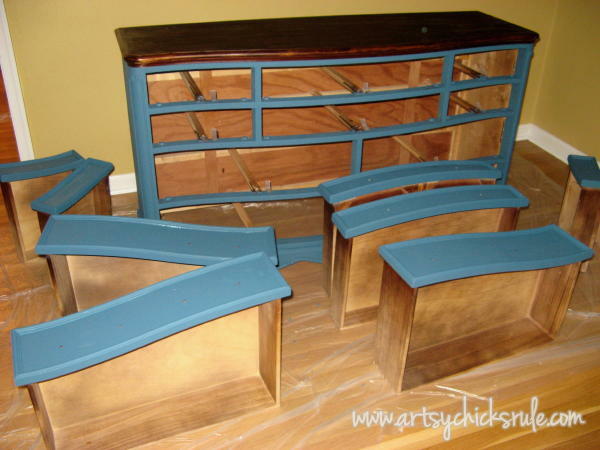 This piece was my inspiration to “just do it!” I had my sideboard, paint, everything. I just could not get started. 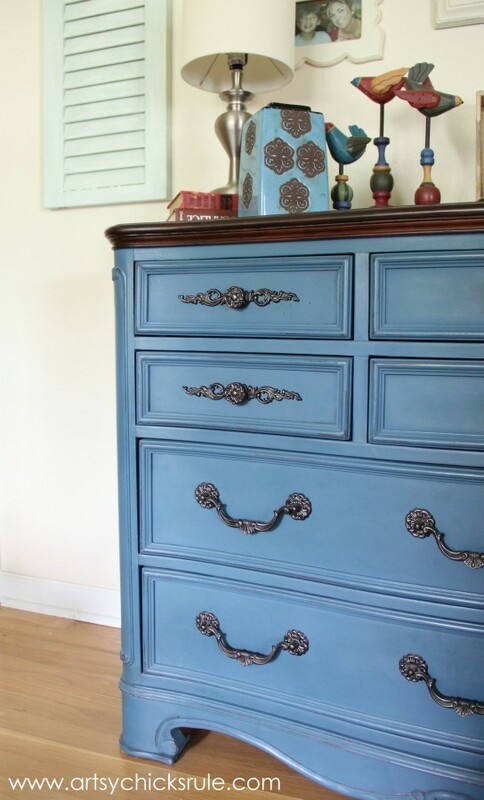 It was my very first chalk paint project. 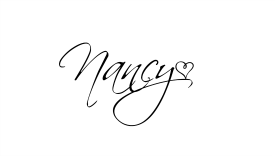 Thanks Nancy for giving me courage! 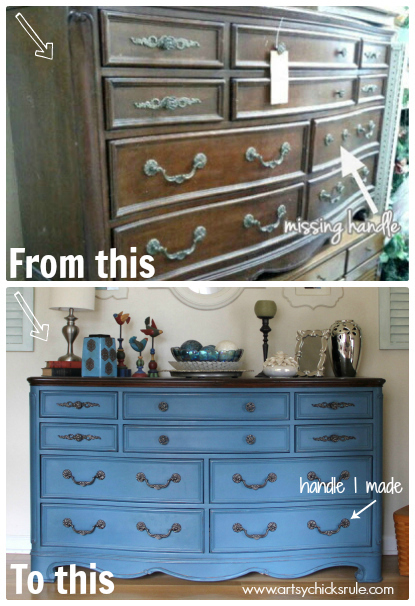 BTW, your drawer pull was magic! Have you painted more since? It’s addicting! Oh how nice Carol! :) Have a wonderful time!! 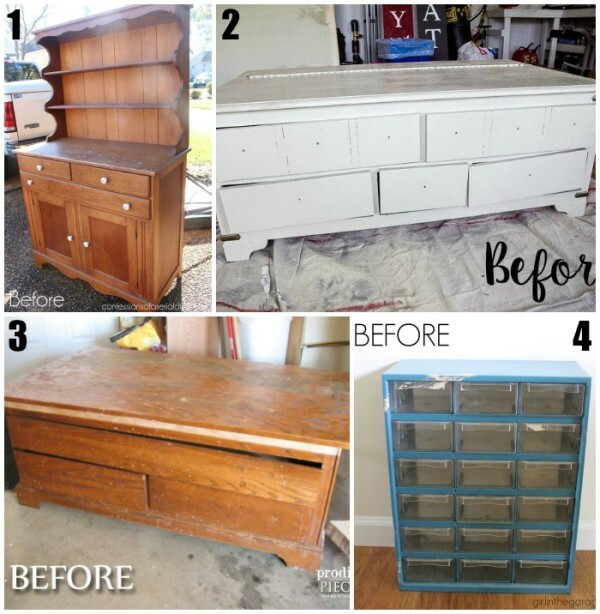 What a gorgeous transformation and I love the idea that you made your own replacement pull. 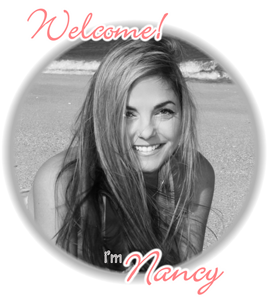 Fantastic, Nancy!! Love thee transformation! 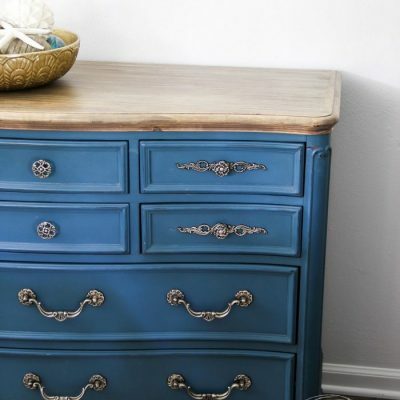 Did you apply a primer or stain blocker before applying the chalk paint? If so, did you spray it on or brush it on? 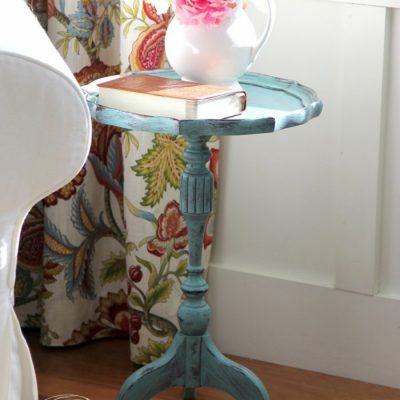 I painted an end table using an off white chalk paint and then applied a clear wax made for chalk paint. When the wax dried I noticed that it caused the paint to yellow. I had to repaint the entire piece. I’d like to apply a top coat but not sure what to seal it with that’s non yellowing. Any advice would be helpful. No, I didn’t need to since I was using a darker color. With a lighter color I may have had to. I usually spray it, when I do. Are you sure the wax yellowed or could it possibly be a bit of bleed through from the wood underneath? 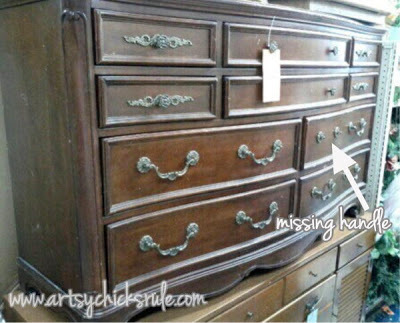 I haven’t had any issues with Annie Sloan Clear Wax yellowing any of my whites. Now, poly will yellow somewhat. Some more than others. My only advice would be to maybe seal with Shellac before using a light paint color, then trying the AS Clear wax instead next go round. that has to be the most incredible job I have seen to date. Yeah, that color is so awesome, I can’t think of a prettier shade of blue! I am blown away with this fabulous project, you da man!! I’d love to know your best way to do the wax. 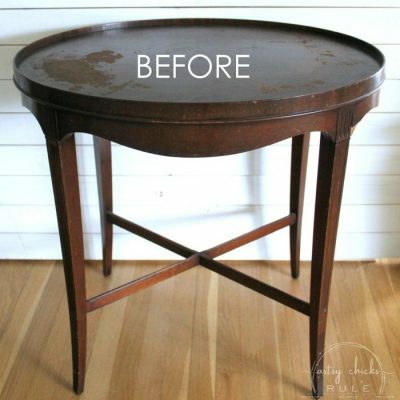 I’ve waxed a couple pieces before with a brush and with a cloth but neither seemed to work well. I can’t wait to try this!